Well, look who’s left in the women’s bracket? North Carolina and Duke. Georgetown (Hoyas, 15,318 students, Washington, DC) 79, MARYLAND 57 – Sugar Rodgers scored a career-high 34 points, and the No. 5-seed Hoyas breezed past fourth-seed Maryland Tuesday night to advance to the round of 16 in the NCAA tournament for the first time since 1993. Freshman Alyssa Thomas had 23 points and 14 rebounds for Maryland (24-8), and Lynetta Kizer contributed 11 points and 10 rebounds. 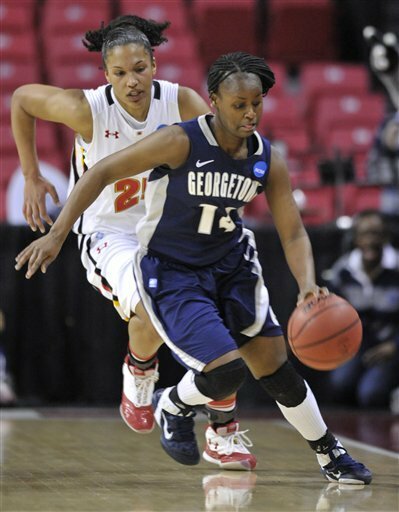 Freshman Laurin Mincy added 12 points for the Terps. Thomas went 11-for-11 at the free throw line with two assists and two blocks. Rodgers’ 34 points included 21 in the first half and 7-of-10 three-point shooting. Monica McNutt and Rubylee Wright each added 14 points. The Hoyas (24-10) jumped out to an 11-0 lead early on. Down 13-1 in the first half, Kizer made a layup with 13:43 remaining to jumpstart a 13-1 run that would tie the game at 14 with 10:35 left in the half. In the first three minutes, Maryland starting forward Diandra Tchatchouang left with a knee injury and did not return. Maryland won the battle on the glass for the 28th game out of 32 this year. The Terps grabbed 40 boards to the Hoyas' 38. 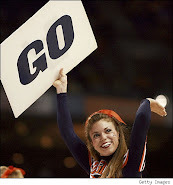 Maryland scored 24 points inside to Georgetown's 10. Sophomore Dara Taylor dished a team-high four assists and Anjale Barrett added three. Oklahoma (Sooners, 29,931 students, Norman, OK) 88, MIAMI 83 – Danielle Robinson scored 18 points as the sixth-seeded Sooners held on to beat third-seeded Miami on Tuesday night in Charlottesville. Miami erased a 15-point deficit to tie Oklahoma late in the second half, but the Sooners sank their free throws late, ending the 'Canes breakout season 88-83 Tuesday night in the women's NCAA Tournament. Whitney Hand scored a career-high 27 points to lead the Sooners (23-11), who will move on to the Dayton Regional two victories away from a third straight trip to the Final Four. Shenise Johnson scored 25 points to lead Miami (28-5), including the jumper with 3:26 to go that tied it at 79-all. 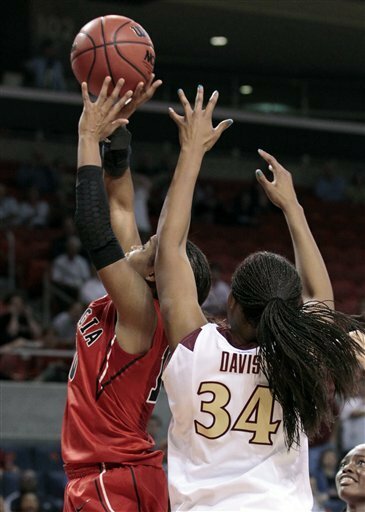 The Hurricanes didn't score against until Sylvia Bullock's basket inside with 47 seconds to play. That made it 85-81, but Hand hit two free throws with 41 seconds to go, restoring the six-point lead, and the Hurricanes' comeback came up short. 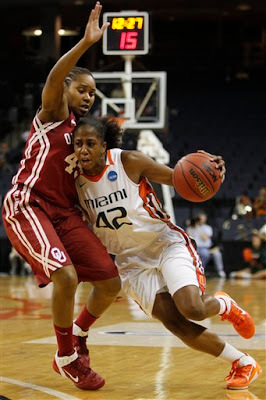 Morgan Stroman added 18 points and 14 rebounds for Oklahoma and Riquna Williams scored 17 for Miami. The Sooners finished with 22 assists on 29 baskets. Georgia (Bulldogs, 34,885 students, Athens, GA) 61, FLORIDA STATE 59 – Jasmine James scored on a putback with 2.1 seconds left, then made the subsequent free throw to lift Georgia over Florida State on Tuesday night and into the round of 16 of the NCAA tournament for the second straight year. The 5-foot-9 James caught the ball in midair after a missed jumper by Porsha Phillips, tossed it in and drew a foul. The opportunity came after Georgia's Meredith Mitchell forced a jump ball following another miss. Florida State (24-8) didn't get another shot off as Christian Hunnicutt's pass to Courtney Ward at midcourt went out of bounds as time expired. The Seminoles didn't have a field goal over the final 10 minutes. Cierra Bravard led the Seminoles with 19 points and 10 rebounds but couldn't deliver them to the regional finals, where last season ended. Courtney Ward scored 12 points, all on second-half 3-pointers, and tied her own team postseason record with nine assists.